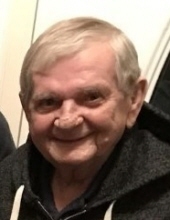 John Sigurdur Magnusson, of High River, passed away at the High River Hospital on April 12, 2019 at the age of 74 years. Loving Father to his daughter Jodi (Tony Arena) and sons Jamie and Mark. His memory will be cherished by his grandchildren: Dario, Trey, Jackson, Rachel, Brooklyn and Ella. He will be sadly missed by his sister Maureen (Wilfred) Maskow, nephews, Trent and Kurt and families. Brother in-law Lorne Van Achte, nephews, Blaine (Sharon), Kelly (Annette), Scott Van Achte, and their families. Brother in-laws: Gerry Moore, Garth and Barry Pritchard and sister in-law Carol Moore and nieces and nephews, Darren (Val) Moore and daughter Sarah Moore (Jesse Legault) and their son Theo, Candace McGee (Bob Nagy) and daughter Cody McGee, Melanie Rheaume (Marc) and their sons Jacks and Hayes, Kathy Boase (Chris) and their children Mckenzie and Nicholas, Geordie and Joey Pritchard and family friend Dave Patton. John was predeceased by his wife Beryl Magnusson, sister Gail Van Achte and nephew Todd Maskow. John loved the games of Curling and Baseball. To celebrate John’s life a gathering will be planned at a later date. An interment service will be held at the Woodland Cemetery near Treherne, Manitoba. To email condolences to visit www.snodgrassfuneralhomes.com Arrangements in care of Snodgrass Funeral Home, High River, AB. Ph. 403-652-2222. To send flowers or a remembrance gift to the family of John Sigurdur Magnusson (High River), please visit our Tribute Store. "Email Address" would like to share the life celebration of John Sigurdur Magnusson (High River). Click on the "link" to go to share a favorite memory or leave a condolence message for the family.